Ebola In The Air: What Science Says About How The Virus Spreads : Goats and Soda Turns out, Ebola is transmitted through the air, but it's not very good at spreading through the airborne route. What in the heck does that mean? We dig into the science to clear up the kerfuffle. 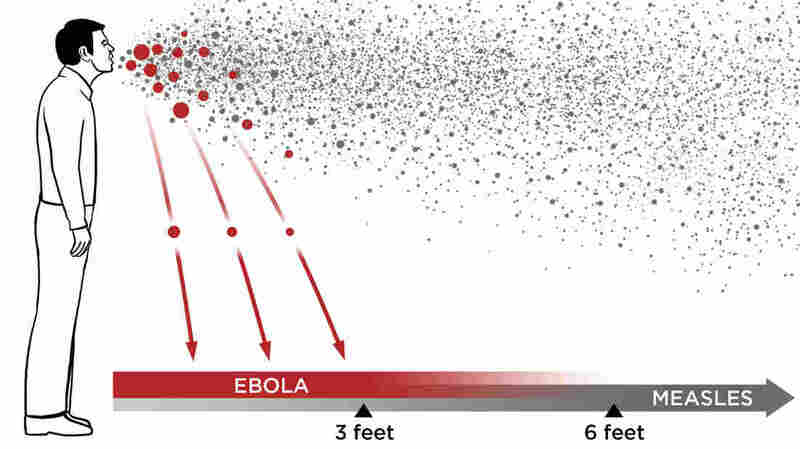 Viruses can spread through the air in two ways: inside large droplets that fall quickly to the ground (red), or inside tiny droplets that float in the air (gray). In the first route, called droplet transmission, the virus can spread only about 3 to 6 feet from an infected person. In the second route, called airborne transmission, the virus can travel 30 feet or more. Here's an Ebola puzzle for you: If the virus isn't airborne, why do doctors and nurses need to wear full protective suits, with face masks, while treating patients? After we dug through studies and talked to scientists, the answer slowly emerged. Ebola does spread through the air. But not through the airborne route. Oh, goodness! No wonder there's been such a kerfuffle about how the virus is transmitted. The story began quite innocently at Harvard University way back in the 1930s. William Wells was a hotshot engineer there at the time. He was figuring out a slew of important ideas about infectious disease, like the fact that UV light kills bacteria. One day in 1933, Wells discovered that pathogens (he was studying bacteria) get trapped in tiny droplets of fluid — maybe some mucus when you sneeze or some saliva when you cough. The pathogens stay alive in the fluid and can move through the air inside these droplets. Clearly this is one way infections spread. But Wells didn't stop there. 1. Droplet route: The pathogen falls to the ground in large droplets. The pathogen doesn't make it very far away from the source of the fluid, but if you intercept the drop's path, you could get infected. 2. Airborne route: The pathogen is lifted up into the air inside tiny droplets. The pathogen floats and can move long distances with air currents. If you inhale this mist, you could get infected. Over the years, the first term didn't really stick with the media or general public. But the second one sure has. And what we've ended up with is one term that often gets used to describe both routes of transmission. But, oh, how they are different! Viruses that move through the droplet route usually travel only about 3 feet (and no more than 6 feet). They stay in the air for less than a second. So to catch these viruses, you have to be within 6 feet of a contagious person. Ebola spreads through the droplet route. There's no doubt of that. A splash of Ebola-infected fluid to your face can be deadly. Viruses that move through the second route — the airborne route — can travel more than 30 feet and can stay in the air for minutes, even hours, when the humidity and temperature are right. That means you don't even have to see the person to catch a virus from him or her. An infected person could sneeze, walk out of the room and leave an infectious mist behind. A few viruses, such as measles and chickenpox, spread this way (that's why they have such high R0s). What about Ebola? In the lab, scientists can infect monkeys with Ebola virus through the airborne route. They essentially stick a monkey's head in a plastic tube and spray the animal's face with a mist infused with Ebola. If the humidity and temperature are right in the tube, the monkey can get Ebola. But scientists haven't found evidence that Ebola spreads through the airborne route in real outbreaks, with real people. Does that mean Ebola never catches a ride on tiny, floating droplets? No. As Wells wrote nearly a century ago, "Failure to discover air-borne infection ... [doesn't] prove its absence." But if Ebola does transmit through the airborne route, the process is highly inefficient and contributes only an infinitesimal amount to the virus's total spread. Take the case of Patrick Sawyer. Back in July, the Liberian-American businessman boarded a plane from Monrovia to Lagos, Nigeria. He was clearly very sick — and very contagious — with Ebola. He even vomited while on the plane. There were about 200 other passengers on the flight. None of them got infected.